Well, I’m glad you asked. Actually there are LOTS of reasons. Other than the fact that they’re sweet, savory and salty all rolled into one, they’re irresistibly delicious. And easy; super easy with only one bowl to clean. Oh, and they’re wonderful for salads, snacking, gifts and make a fantastic little pre-dinner nibble. I love that you can make these nuts well in advance and just pop them in the freezer in little storage jars. Pull a container out a few hours before serving and place them in a pretty bowl – guests won’t have a clue you weren’t roasting nuts just before they arrived. And if you’re thinking brown butter might be a little tricky, nope – not this time! It’s done in the microwave in less than 3 minutes. Just add a few other ingredients: maple syrup, Worcestershire sauce, garlic powder, fresh rosemary, kosher salt and of course, the pecans. 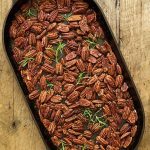 Give it all a good stir to coat the pecans and they’re ready for a slow roast in the oven till they’re golden, crisp and full of fabulous flavor. Are you convinced? I thought so. I could stop here, right? 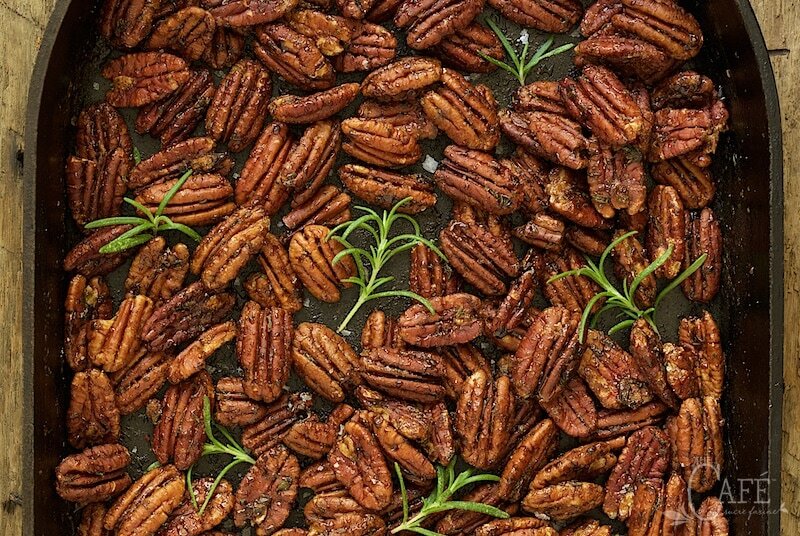 But it’s only fair to tell you that there is one negative thing about these Maple and Rosemary Brown Butter Pecans. And let’s not tell The Café photographer that I revealed this, okay? Just between you and me? Ready? Here goes; they’re extremely addictive and pretty much impossible to hide. Well, at least at our house. I thought I had quite a good supply of these tucked away in a secret place, but when I went to look… not so much. I guess there was a mouse in the house, once again. Have any mice at your house? How about nut lovers? Friends and/or family that enjoy healthy, delicious snacks? 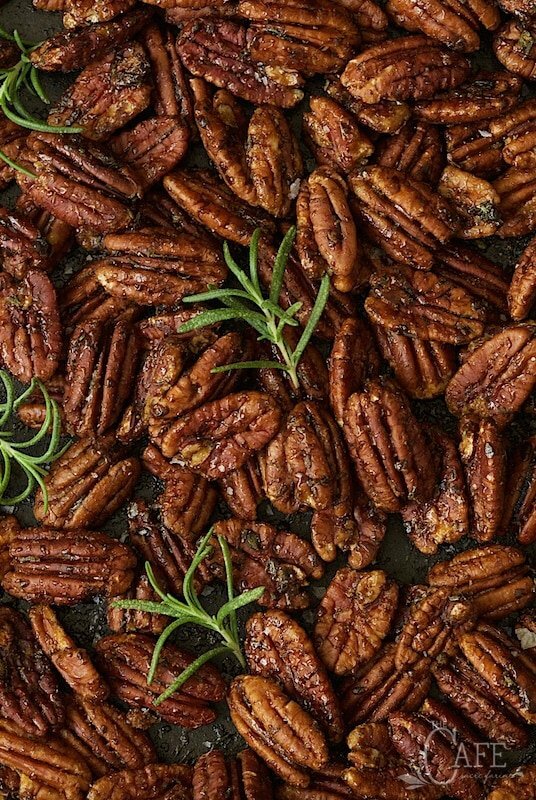 Surprise them with a batch of these Maple and Rosemary Brown Butter Pecans. Just know, they’ll be requested again and again! 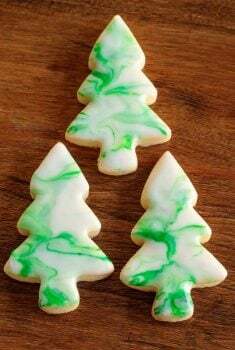 With a magical combination of maple syrup, brown butter and rosemary, these are addictively delicious - be sure to make plenty! Preheat oven to 300°F. Line a sheet pan with foil for easy clean up. Lightly grease pan with oil. Place butter in a large microwave safe bowl. Cover bowl with a microwave-safe plate that fits over the top of the bowl*. Microwave on high for 2 1/2-3 minutes or until butter starts changing color from pale yellow to a light golden brown. The butter will continue to cook after you remove it and will turn a bit darker, so don't let it go past light golden. Start checking it at 2 1/2 minutes and watch carefully. Bowl will be hot, so use oven mitts to remove from microwave. Let the butter cool for about 10 minutes, then remove plate. Add maple syrup, Worcestershire sauce and garlic salt.. Stir gently to coat, then sprinkle with sea salt and 2 teaspoons of the minced rosemary. 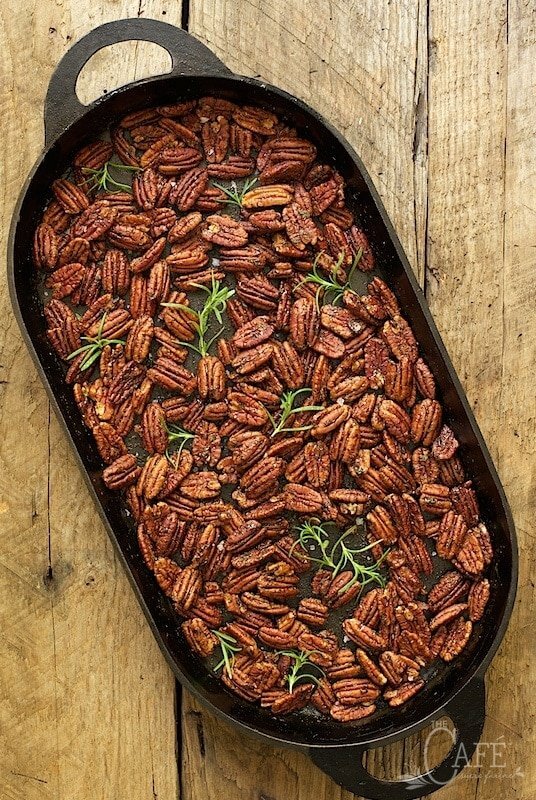 Transfer pecans to prepared sheet pan and spread to a single layer. Bake 20-30 minutes or until golden brown, stirring every 10 minutes. (Every oven is different so be sure to check after 20 minutes. )I like to use a heat-resistant silicon spatula for this so the foil does rip. Remove from oven and sprinkle with remaining 2 teaspoons of rosemary and a bit more sea salt. Toss and set aside to cool. Stir several times during cooling to keep nuts from sticking together. 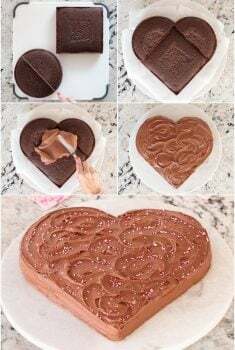 * I used plastic wrap to cover the bowl with success but a reader reported that her plastic wrap melted so I amended the recipe to use a plate instead. These were excellent. Second time I used pecans and walnuts they were great too. These nuts are delicious, Chris! I can see now that they will make a great holiday gift in a jar. You’re welcome Paula! They are so addictive and versatile! Thanks, Chris, for another recipe I added to my favorites. These pecans are absolutely delicious. I’m going to substitute raw almonds next, just because the flavor combination is so, so good. Thanks Pat! The almonds sound delicious! Pecans are my favorite nut! I really love all nuts but if I could only eat one of them for the rest of my life it would be pecans. 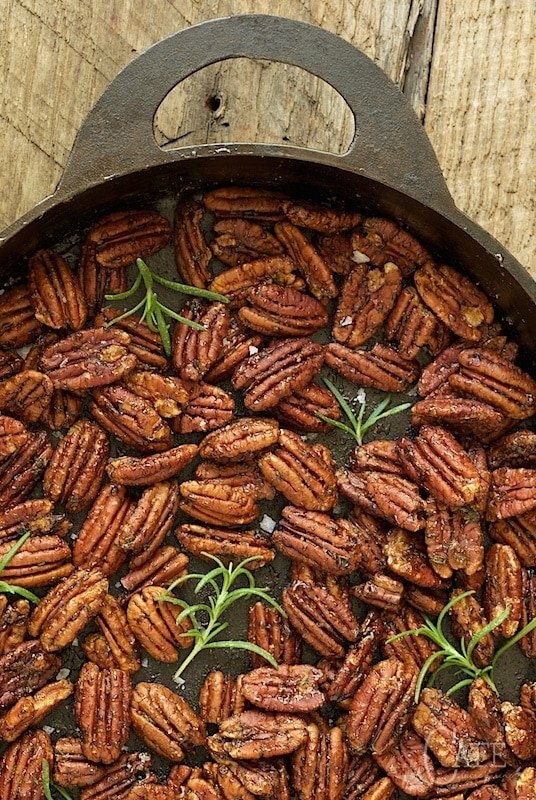 What a delicious roasted pecan recipe! Thanks Susan! It really is hard to beat pecans! 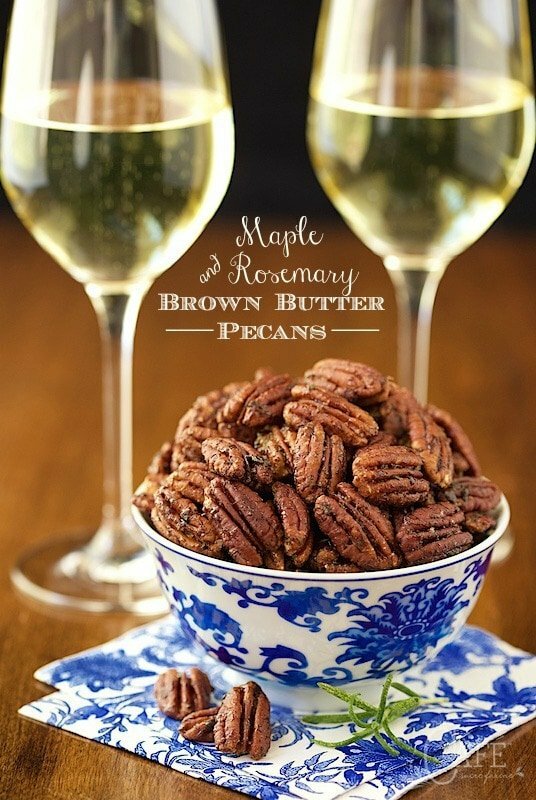 Lovelovelove rosemary and pecans, so I can’t wait to make these! One little question…regular or unsalted butter? I am guessing unsalted since there is added salt, but I just wanted to be certain. Many thanks! I actually used salted butter but unsalted would work fine. Just taste them at the end and see if they need a bit more salt. I think walnuts would work just fine Adina. They are so good with anything! And so versatile too! Maureen, you crack me up! Those little nuts have a way of sneaking calories into us when we’re not looking, don’t they? Chris these sound wonderful and a delightful savory snack. I’d probably have to omit the rosemary since it tends make my husband sick, but this is a great recipe. I love your pan – who makes that? We’re not sure of the origin of the pan Vicki. We found it at our daughter’s house when she moved in. Some comments on the Maple and Rosemary Brown Butter Pecans recipe I just made..
2. cooked pecans for 25 minutes at 300 but this was too long as they have a burnt taste. – size of pecans must be a factor for cooking time. Thanks Maryanne, I guess there are different types of plastic wrap. I made them several times and didn’t have any problem with that but I’m happy you let me know. I’m going to change that part of the recipe to putting a microwave safe plate over the bowl. Every oven is different so I’m also going to suggest checking them after 20 minutes. So sorry your pecans tasted burned, I hate wasting good ingredients. 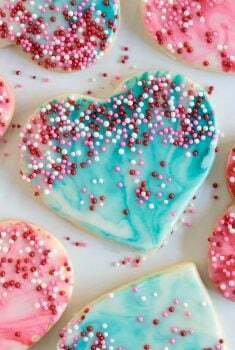 I am sure it would be better to do this nice recipe w/o plastic and alum foil! Both are known to be hazardous. Use stainless steel pan for butter melting, and skip alum foil when baking. Messier, more dishes to wash, but way healthier! Thanks for your input Gigi. Yes, there are lots of different ways of doing things. To be honest, I’m pretty lazy so foil and plastic wrap are pretty indispensable in my kitchen but I’m sure there are many who would agree with you. Hope you enjoy the nuts! These would be great on just about anything! I love your creative, and beautiful, flavor combinations – would it be okay to say you are the nut queen? Haha – beautiful Chris – sharing! I don’t see why not Tricia. Most of my family think I’m a little nuts! Love this time of year and making various nut snacks. The maple and rosemary combination would be tasty. Going to make a batch! I think you’ll love them Kate! The combination of maple and rosemary..is just sensational. These are such a great snack. They really are Angie! Thanks for your comment. These pecans look incredible, Chris! I know I’d eat more than my fair share, especially when flavored with maple and rosemary! Sweet and savory is pretty amazing, isn’t it Laura? Yes, he’s always into the nuts stash. Loves them like crazy! 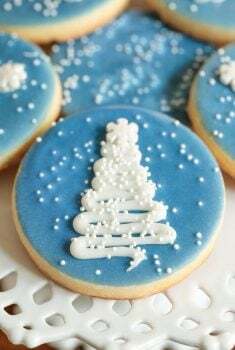 I’d like to make some small batches to have on hand for holiday hostess gifts. How many pounds pecans will this recipe work for? Terri, there’s a little less than four cups of pecans in a pound. Hope that helps! I love all your roasted nut recipes, Chris, and I recently bought a big bag of pecan halves for some kind of nut mix.. The flavors of maple and rosemary together is unexpected and sounds lovely. I have tons of fresh rosemary growing just outside my front door, so I’m all set. Thanks Sue! Scott could literally sit down and eat his weight in these, if I let him. He loves any kind of nuts and especially spiced nuts.